Dr. Henry I. Miller’s May 15, 2014 opinion piece in the Wall Street Journal has indeed made waves in the organic farming community. 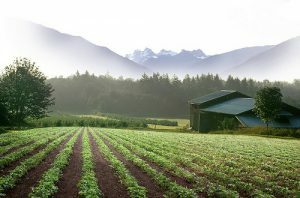 Miller, former director of the Office of Biotechnology at the U.S. Food & Drug Administration, argues that conventional farming—which uses synthetic pesticides, herbicides and fertilizers and often genetically modified (GM) seed stock to maximize yields—is actually better for the environment, producing more food and using less water compared to organic farming. “If the scale of organic production were significantly increased, says Miller, the lower yields would increase the pressure for the conversion of more land to farming and more water for irrigation, both of which are serious environmental issues.” He adds that conventional farming’s embrace of GM crops—ano-no to organic farmers—is yet another way we can boost yields and feed more people with less land. But, the Washington, DC-based Organic Center takes issue with Miller’s allegations about nitrates polluting groundwater: “Most studies that examine nutrient runoff show that organic production methods result in reduced nitrogen losses when compared to conventional crop production,” reports the group. The Organic Center also disputes Miller’s claims about the organic farming’s carbon footprint, raging that overall energy usage and greenhouse gas emissions are much less from organic farming than for conventional agriculture. The group also says that taking into account the greenhouse gas emissions that come from the production (not just the use) of synthetic fertilizer changes the equation entirely. The group cites a recent study by the UN Food and Agriculture Organization which found that organic agriculturecan potentially reduce overall greenhouse gas emissions by 20 percent compared to conventional farming. Also, Miller’s statements about GM crops overlook the ecological problems associated with their use. “For example,” the Organic Center reports, “transgene movement from GM crops to wild, weedy relatives could increase the invasiveness of weeds.” Also, genetic modification has led to higher pesticide use in agricultural systems and an increase in herbicide-resistant weeds. Some worry this is leading to a vicious cycle whereby farmers use more and more chemical herbicides to battle hardier and hardier weeds. Read the full story via Is organic farming sustainable? | North Denver News. 2 Responses to "Is organic farming sustainable?" Whose money paid for the load of cr$% for this article???!!! I’m totally suspicious. We’ve spoken in person to organc farmers here in the San Juoaquin valley comparing organic to traditional farming and found the yields to be the same. We’ve called and hundreds of farmers and the ONLY farms producing less yield ate the ones that are nextdoor to farmers using unresponsible methods, ie pesticides that kill not onnlu pests but bees. Without bees we are not able to produce 60% of our food. Why are we not just killing ourselves but why does our government want us to die? Is this thie way of population control?!!! Why are they so threatened by the 1% of organic.farmers out there trying to keep bad pesticides out of our foods being attacked?? Let the people decide what we want. This.countey is not not supposed to be a dictatorship. What is happening to our world? Thank you, Liz. Totally agree with you. The original article by Dr. Miller is completely biased and it’s a shame that rubbish like this actually makes into the mainstream media.